I played Sellswords and Spellslingers again last Friday, courtesy of Cpt.Shandy who provided figures, table and scenario. All I did was bring my own hero figures and the camera. 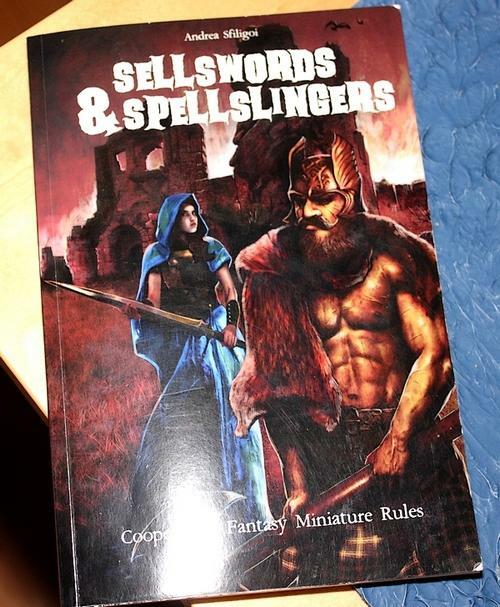 Sellswords and Spellslingers, released in early 2018, is one of the latest works of industrious veteran rules smith Andea Sfiligoi who also wrote Four against Darkness, Rogue Stars, the legendary Song of Blades and Heroes and its derivates and many other nice things. The rules were published by Ganesha Games. 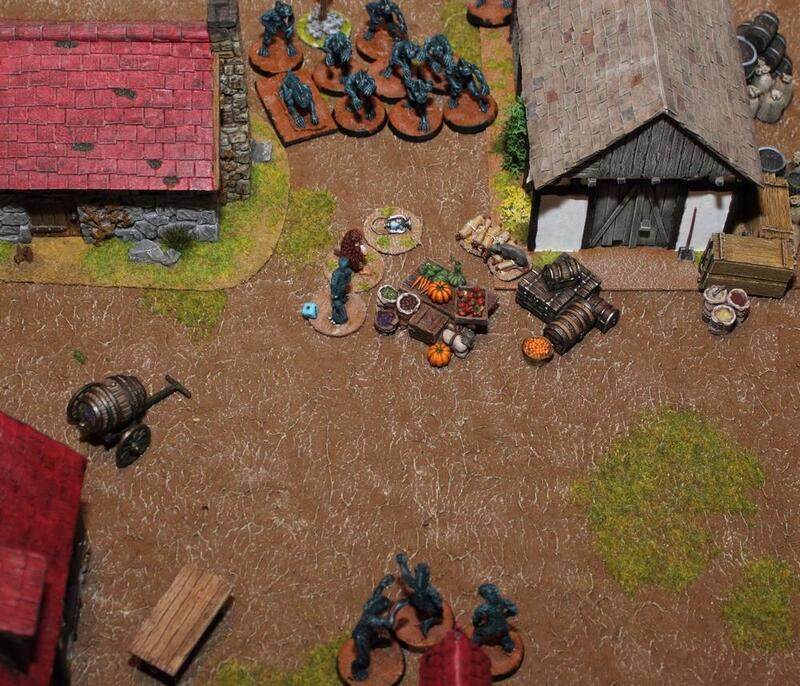 What sets this game apart is that it's a completely cooperative fantasy miniature game. This positions it right between dungeon crawler board games (like Decent and Heroquest) and Pen&Paper RPGS (like GURPS, The One Ring, etc.). Each player plays one or multiple hero characters. Baddies are all played by an AI which is built into the game, which works really quick and efficient. At its core Sellswords and Spellslingers is based on D20 rolls; as with most games written by Sfiligoi everything starts with activation rolls. It's a player's turn, the player chooses one of their characters they want to activate. Then they roll one, two or three d20. 8 or more means the die may be used for a hero action, any dice showing less than 8 means a card is drawn from the events deck. Most of the time these cards will activate or spawn enemy models. Some of them are scenario-relevant event cards. Enemies who get activated act in a very simple manner. 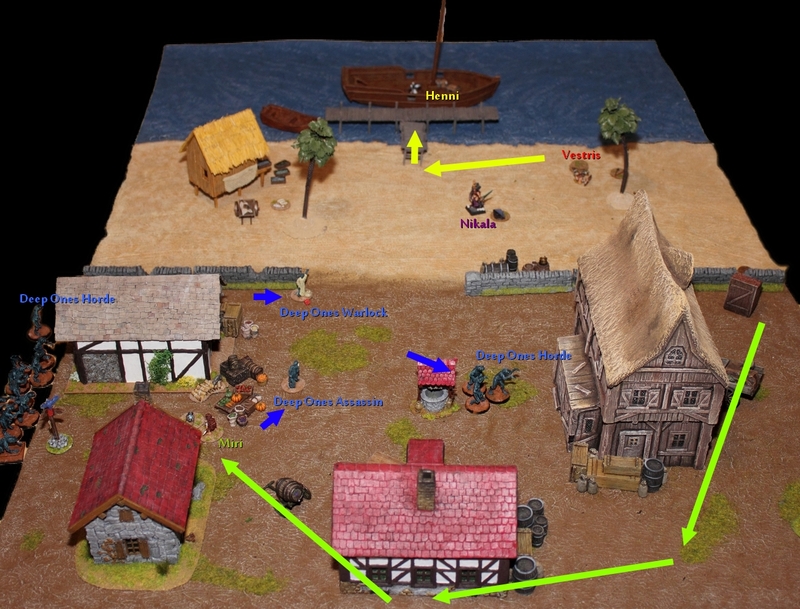 Scenario design is a large part of the game, if you don't want to play the same thing over and over. This also means though that you can do ANYTING with these rules and really get some fun adventures going on your games table. 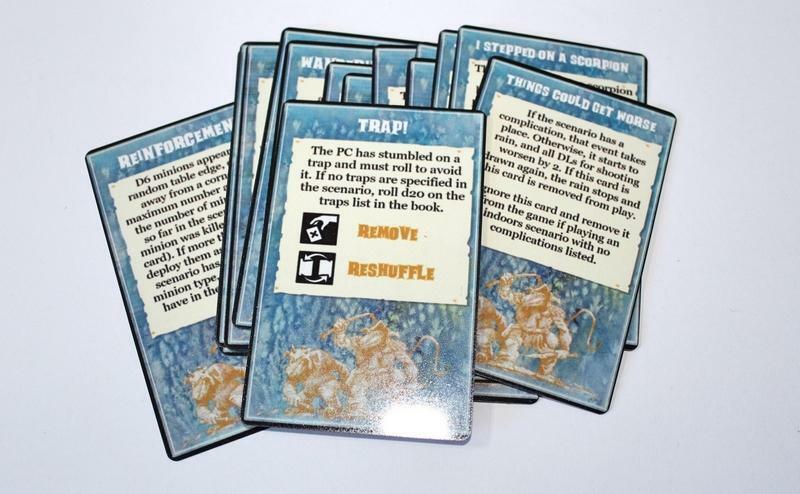 The event cards are delivered in pdf form along with the game, so you have to print them yourself. However, you can also order professionally printed decks. These monster cards give you all the informations about a monster type to play it in the game: the creature's Danger Level (bascially the target of your D20 roll when fighting the creature), hit points, close combat damage, the loot they drop when slain and of course special rules. Based on this simple scheme you can design your own creature types or adapt creatures from other games without a problem. So much for the rules, now let's go on to the game. Beware: it's getting spooky. Also beware that there's a slight Lovecraftian theme going on, but I was assured by cpt.shandy that this, if it is to become a campaign, will be a straight-up fantasy thing without any more reference to Cthulu things than we find in this scenario, so I put it in this forums section. Hope that's okay. 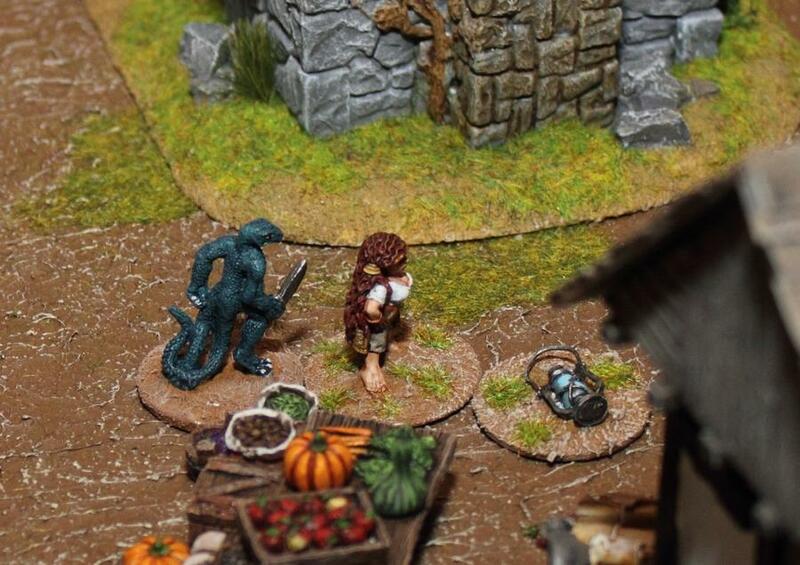 The fishing hamlet Inmutz is overrun by horrible creatures. They crawled out of the sea at night. They look remotely human, but with scaly skin, claws and heads like fish or frogs. They are just known as the Deep Ones. Inhabitants who managed to flee beg a group of adventuring heroes to visit the hamlet to find clues about why these monsters suddenly attacked them and what their motifs could be. These two veterans of several aventures are played by Cpt.Shandy. The other two, adventuring newbies, are played by me. and Nikala, a Dark Elf Soceress (Spells: Magic Dart, Deathcurse), who really only wants to collect money for a passage back to Naggaroth. She doesn't like the beach, and she dislikes the crabs, the sun, sea monsters, long walks, waiting, sand and unfathomable horrors beyond our comprehension even more. To learn about the motifs of the Deep Ones there are five clues strewn across the table. We have to get to as many of them as possible and then interpret them correctly (ie roll an intelligence check). Two of them are to be found in the hamlet, two more on the beach and the fifth is to be found on a mysterious boat lying at the pier. There are still groups of Deep Ones lurking in and around Inmutz and without a doubt more will show up once alerted. Nobody knows what they are doing. Looting? Are they looking for something? Or are they just lurking? Nobody knows. 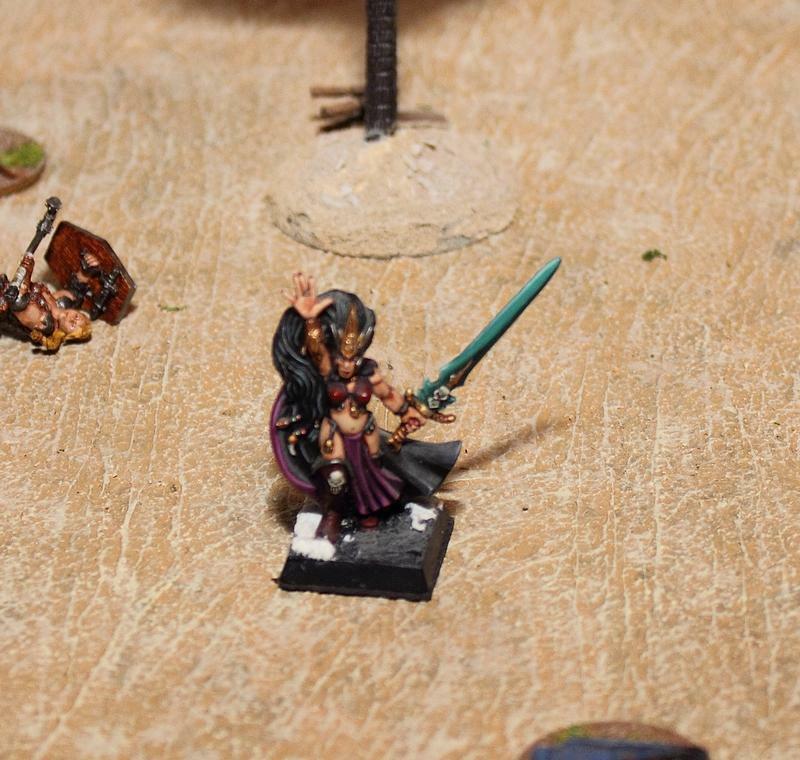 At the moment two groups of 3 Deep Ones each are in the area, plus a Deep One Assassin and a sort of leader wearing a robe, so he may either be a spellcaster or he looted a nice dress. The two warriors immediately sprint towards the first clue. Nikala follows at half speed, unhappy with what the salty sea breeze is doing to her hair. As a sudden gust of wind ruins her 'do completely. The soceress is really miffed now. 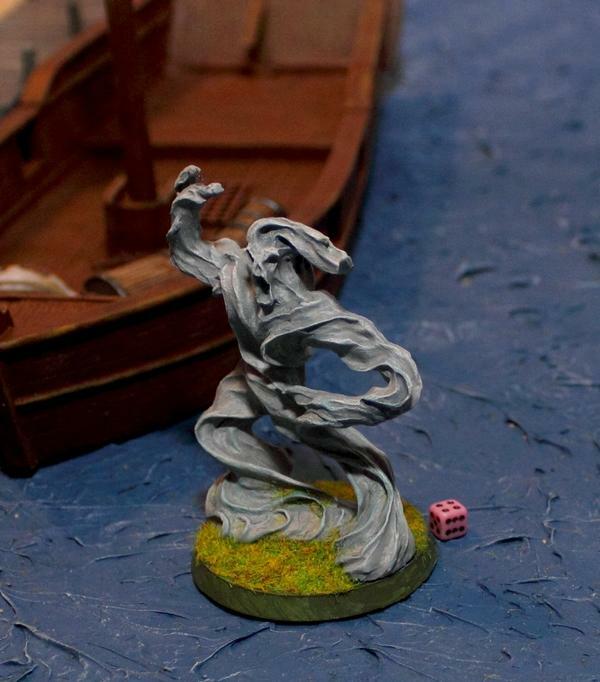 Even worse (depening on who you ask) - the wind carried a stray air elemental ashore! This comes as a surprise, especially seeing as how an air elemental is really tough, especially if all we have is non-magical weapons. The sorceress is tangled up with trying to fix her hair, so the half-hearted magic darts thrown at the air elemental mostly miss. 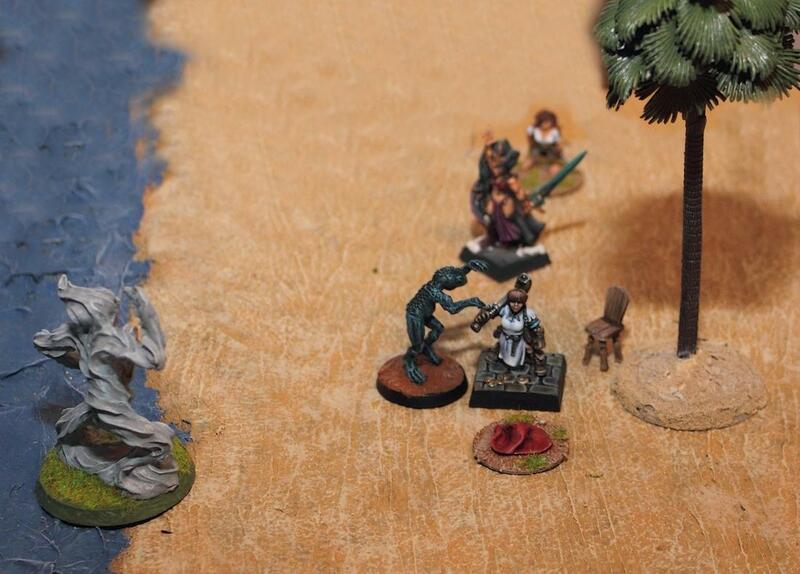 A cunning Deep One uses the opportunity to lunge at Henni who was just about to prepare to combat the air elemental. She loses one hit point (out of 4). Fortunately repeated hammer blows to the head proves effective against Deep Ones. The air elemental though is drawing ever closer and the magic darts fail to do any serious damage. This will have to be decided in bloody mêlée. Faced with the huge elemental Henni freezes. In the last moment Vestris leaps to her aid and duels the monster. The red towel is the first clue to inspect. 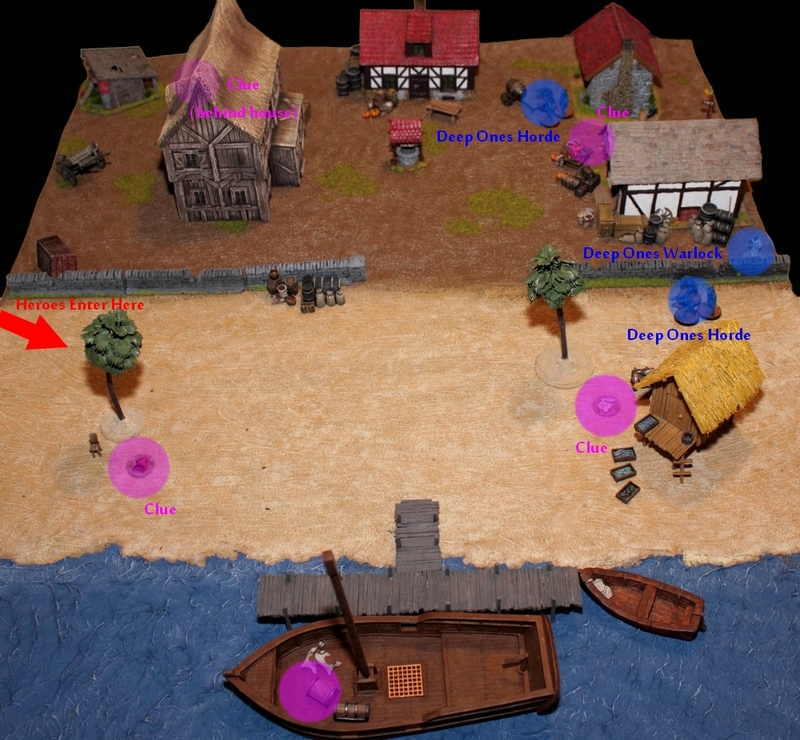 The other round markers on the ground are loot markers left by slain enemies. She fights bravely, but eventually the elemental's attacks take their toll on Vestris and the warrior goes down. Henni manages to get herself together and finally kills the elemental. Meanwhile Nikala is embarassed about her lacklustre spellcasting so far and that Vestris got hurt to to this fact. That makes the sorceress angry. A group of Deep ones, drawn in by the noise of combat, fall victim to a mix of Deathcurses by the Dark Elf and Miri's arrows. Now that the most immediate dangers are taken care of Henni looks after her downed comrade. Fortunately Vestris is just KO'd. She'll be out for now, but can be recovered once all the business is done here. So the first clue is being investigated, and then rolled up and put under Vestris' head. For comfort and to pin the clue in place. Now rain sets in. This means two things: Time for drama and a malus for ranged attacks. We've been delayed by the air elemental for too long; now it's time to move. Miri jumps over the stone wall to search the hamlet by herself. The short-legged Dwarf and the Dark Elf with the ill attitude and high-heeled boots would only slow her down. Finally activation rolls go better for us now and our heroines proceed with the mission. Miri dashes into the cursed hamlet of Inmutz using shadows and debris to stay out of sight. She grabs one of the clues on her way. One more to get in the hamlet, but this one's more tricky. A mysterious lamp next to the former grocery storage building. The place is swarming with Deep Ones; the produce is strewn on the ground and already mostly spoilt. 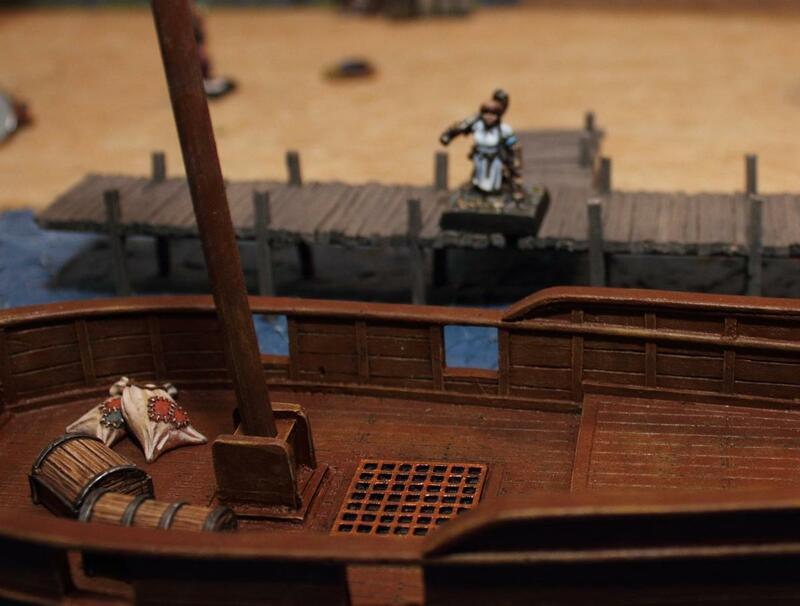 In the mean time Henni sees the mysterious boat which had just appeared the night before the attack slowly drift off to the sea, along with possibly clues. ..is swiftly dealt with by a good whack across the head. With the boat slowly drifting out onto the sea Henni has no time to lose and starts digging through the ship's cargo for clues. She finds something and even makes it safely off the ship moments before it goes off onto open waters. There she spots the Deep Ones Warlock over at the hamlet's entrance. A sorcerer duel. Delightful. Meanwhile in Inmutz Miri snuck up to the second-to-last clue. While she investigates the shadows around her come to life. 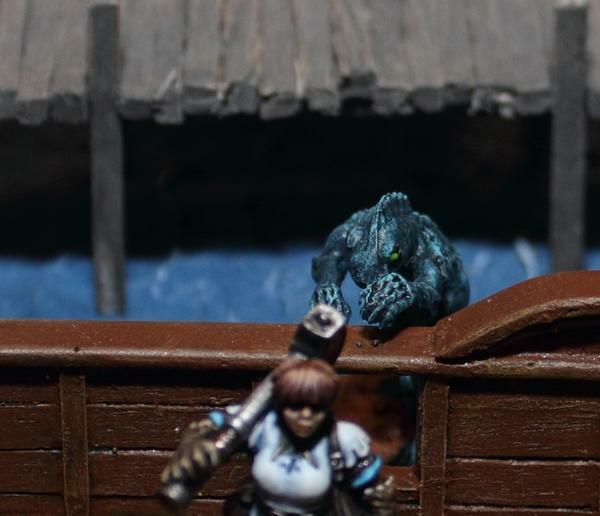 The Deep Ones Assassin charges at Miri from behind. A Rogue duel. Perfect. 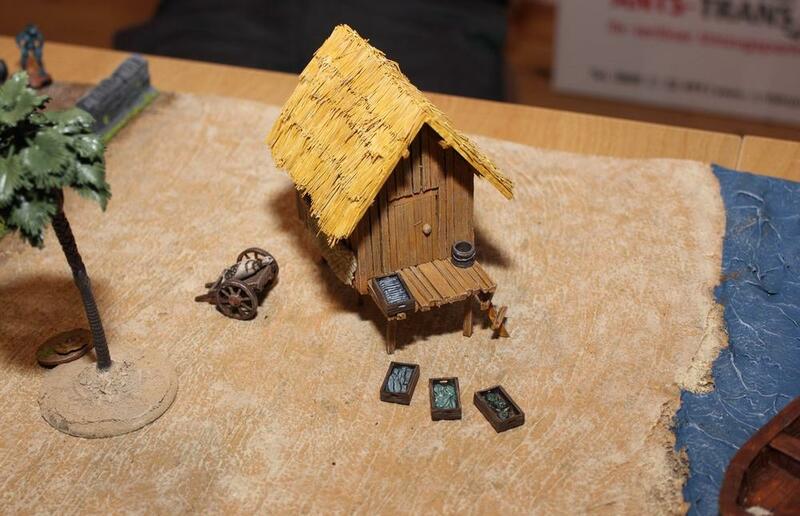 Despite the moment of surprise the halfling outsmarts the abomination. She wants to return to investigate the clue, but can't resist grabbing any valuables she can find on the Deep One. This costs important seconds, and just as Miri is done stuffing her pockets and having figured out the clue the horde comes for her. She manages to flee the onslaught of claws, teeth and scales, but is lightly wounded in the process. The only thing to do now is flee the hamlet. Three hordes of Deep Ones are in hot pursuit, but Miri is faster. As she gets closer to the hamlet's entrance she hears a torrent of insults and curses being shrieked, howled, bellowed, gargled and croaked. 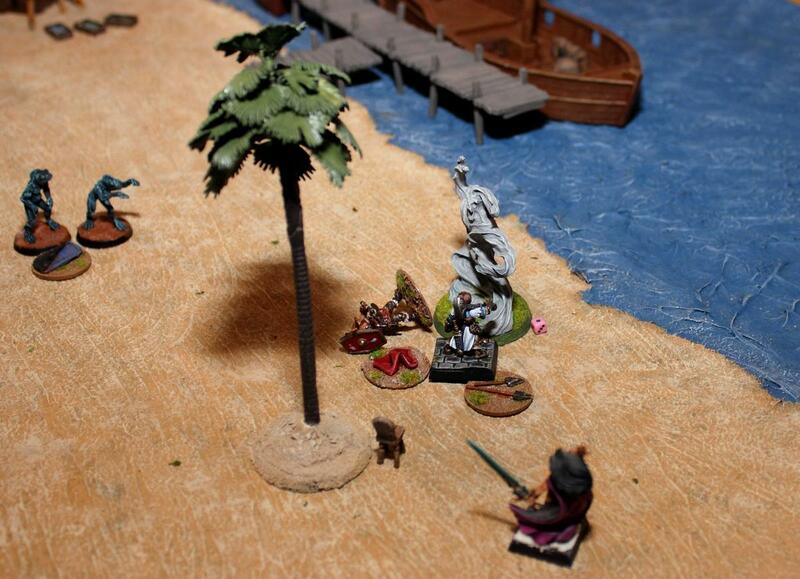 The sorcerer's duel is in full swing, with Nikala clearly coming out on top. 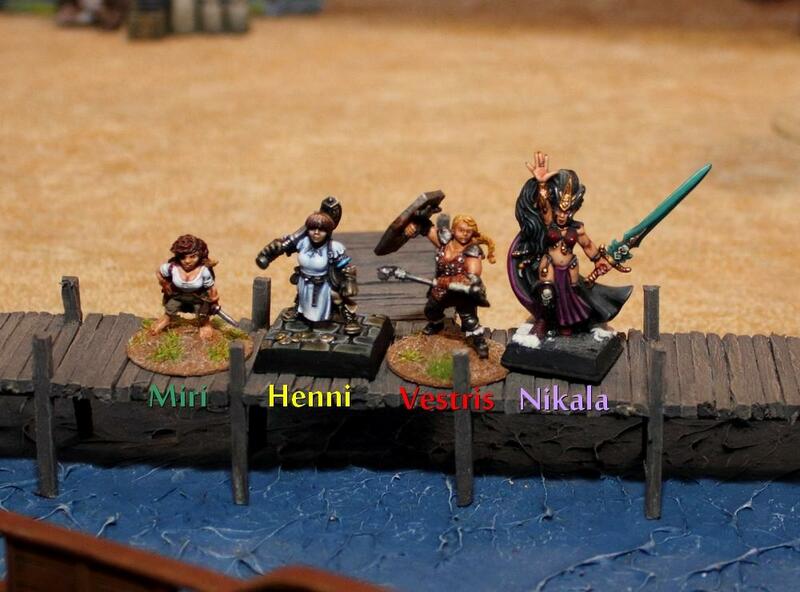 The wavering Deep Ones Warlock is finally finished off by a pincer attack of Miri and Henni (who had run up the beach again to help Miri out with her pursuers). Miri, delivering the fatal blow to the warlock, once more couldn't resist grabbing his valuables and a magic potion the creature carried with him. Now it's really time to go home. A bit earlier Henni had used the élan from her boat jumping episode to investigate the final clue at the fisher's hut. All done. Last thing we have to do was pick up Vestris before the flow sets in and she's pulled out into the ocean and then it's off to the next Inn. Clues have to be put together. Maybe then we'll get a better idea of what the Deep Ones are after. Apart from the fact that Vestris got hurt, the whole thing is a great success. We managed to investigate all the clues, and Miri managed to grab a whole lot of money too. The fact that the air elemental popped up right on turn#1 was of course remarkable, but in hindsight probably for the best as at this point we were still fresh and all lumped together. In my mind Sellswords and Spellslingers is a game which thoroughly succeeds at what it set out to do. Of course it's a bit of a strange one, sitting between two worlds. 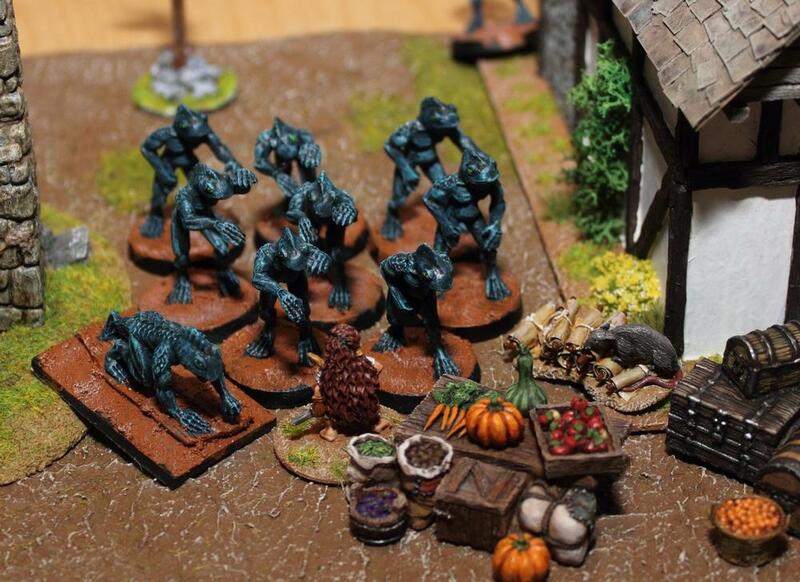 It requires a bit of preparation, especially if you play more often, so scenarios don't get repetitive and if you want to play it all with miniatures you should prepare a collection of quite a few evil minion models (deep ones, goblins, skeleton warriors, giant spiders, Orcs, etc). 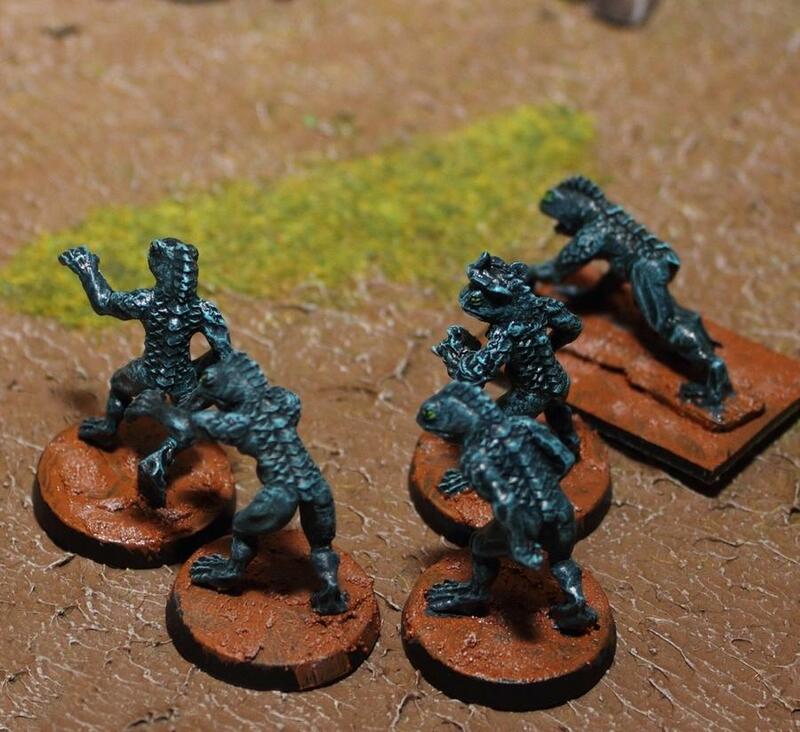 For the very last group of Deep Ones who spawned we'd run out of Deep One figures, so a group of Night Goblins popped up as stand-ins! So you either get a whole lot of minis (never been a huge problem for wargamers, I hear), or you make the scnearios fit you collection. OR of course you use printed markers. The rulebook supplies you with hundreds of monster markers in pdf form which you can print and put on the table this way. The Genasha Games website suggests having 3-8 monsters at hand for each player character in the game, as well as 1-2 boss monsters as a general suggestion. 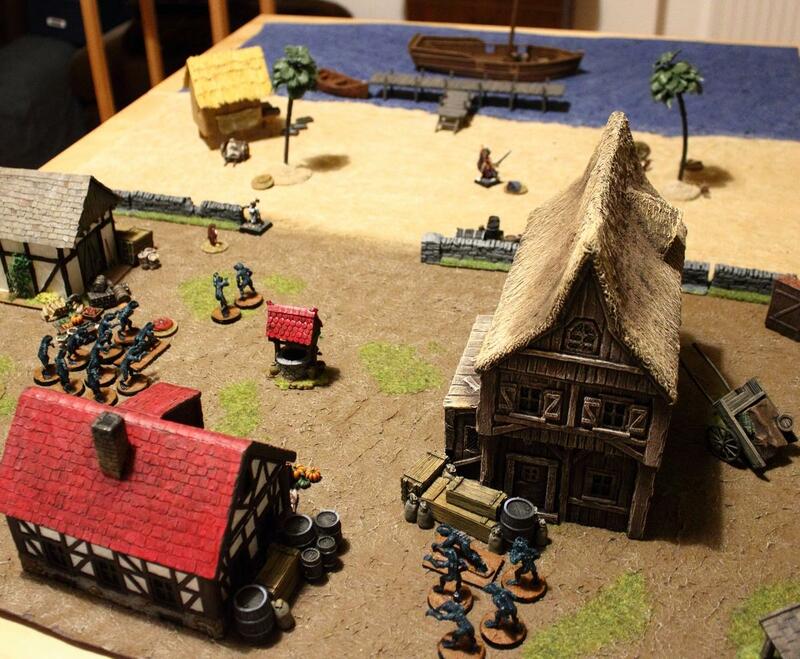 Games take place on a 36"x36" sized table, by the way. The event deck is a simple and clever design. Events get discarded after they are played out, so as the game progresses there are relatively more monster activation and monster spawn cardsin the deck. This leads to naturally progressing tension in the game with a climax of hordes of enemies, and thus putting some time pressure on the players to get the job done. Another plus of the event deck is that no DM/GM/umpire is required. Even to the person who designed the scenario 90% of how the game plays out will be a surprise. Of course it's very important, as with any role playing game, that the game is played as a campaign rather than single games. Then Sellswords and Spellslingers works really well. I hope that you enjoyed this game report! Thanks to Cpt.Shandy for the scenario and another good game. I'm looking forward to more adventures with these characters! Very nice game and analysis of the rules. Very nice AAR/review. A good looking game too. Thanks for that. Excellent AAR, thank you! It give a very good feel of how these rules work. Are the card decks available from Lulu as well? Can I ask where the Dwarf Gunner card came from? I've got both Sellswords and the Count Carialis supplement but can't find any dwarf cards. I don\'t know whether to be a good example or a horrible warning. @Ethelred the Almost Ready: Thanks very much! Hope it helps spread the word about this unique and enjoyable little game. @Dentatus: Thank you for reading and commenting! @Arundel: Cheers. A paperback version of the rules is available through Lulu. I think the printed cards are only available through Drivethrucards for some reason. @capthugeca: Thanks for reading! 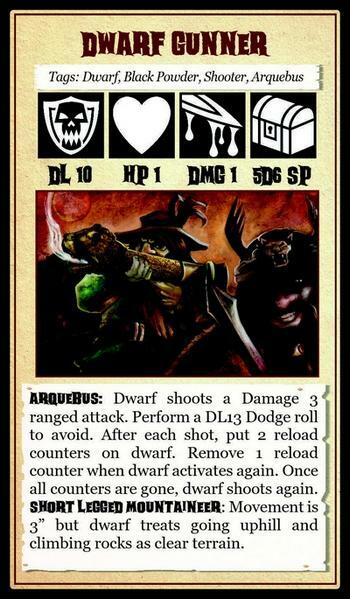 To be honest the Dwarf Gunner card only popped up in a google image search I did for monster cards and I used it as an example for a creature with ranged combat. Thanks - found them on Wargames Vault though $9.00 seems a bit steep for just 24 cards when the whole ruleset and plus the necessary gubbins costs $8.00. That looks like a great scenario. I've really been enjoying SS&SS as well. 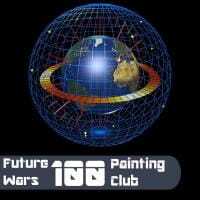 Did you build your group with the standard 60 points? Yes, the characters are about 30 points each. So two groups with each character being 30 points. We usually play three characters per 60 points. If we include a spellcaster they end up more than 20 points with the other characters being slightly under 20 points. I may try fewer more powerful characters and see how it goes. An excellent write up, thanks for sharing! I look forward to the follow-up.